The technology that deeply influences the world of designing is quickly making progress, ORICAD born to meet new market demands and has been created and developed to fulfil the knitting operator needs. 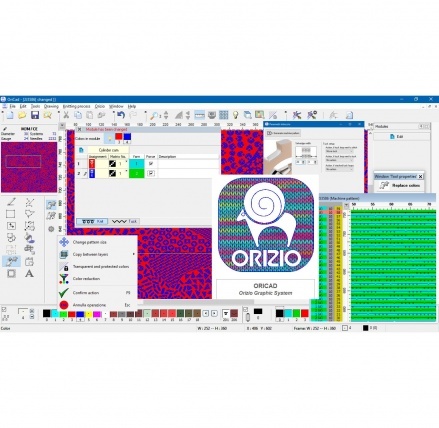 ORICAD has new tools like the special vectorial graphic solution, in this way the daily work becomes more comfortable as well as the operation result of the knitter. Optimised for Windows 10 ORICAD is fully compatible with the old Orizio machine models, it is a user-friendly program that allow the user to stop or give transparency to colours, to make special copies, to remove drawing troubles using the new functions ‘find & replace’ and many other easy instruments. All the advantages of the new program are possible even maintaining the easy way to convert the drawings into stitches well appreciated on the well-established ORIDES program. Get down to work! For more information contact us.